Well, that is the case with Fredrick Douglass . . . a self-taught, intelligent man born into slavery who achieved freedom through gut wrenching determination. And as a free man with his indomitable spirit fully unleashed, Fredrick Douglass went forward with resolute purpose . . . becoming the 19th century civil rights leader and an unyielding scholarly advocate of the constitution . . . equaled by his great love and pride of America. Moreover, Fredrick Douglass was an important advisor to President Lincoln, who he convinced to allow Blacks to fight for the North in the Civil War by saying . . . "Allow us the dignity to fight for our own freedom" . . . which changed the direction of the war and all that was to follow. This visionary man was truly a blessing to America . . . and none more so than at this critical time! So, it is very fitting as we celebrate the birth of the USA in a few days on July 4th . 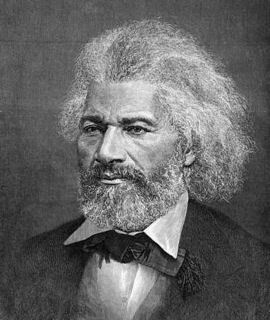 . . to proudly announce the recognition of Fredrick Douglass as a Great American Patriot by USA Patriotism! I sincerely hope you take the time to learn more about Fredrick Douglass . . . and will spread the word about this deserving Great American Patriot.